Martin Luther King, Jr. looked forward to the day when a person would be judged not by the color of his skin but the content of his character. That day has drawn close in the person of Senator Barack Obama. He is not a “black candidate,” but a candidate who happens to be black, and he speaks directly to the issues confronting all Americans, in order to unite Americans in finding solutions. As his ads say, he doesn’t want to be president of liberal or conservative America, but of the United States of America. As an orator, he lifts us up, inspiring us to believe that we can come together and meet any challenge. If nothing else, Barack Obama’s candidacy signals that we have come a long way in overcoming America’s original sin, slavery, and the Jim Crow and segregationist policies and attitudes that were its toxic legacy. The work of reconciliation is the work of Christ given to the Church, and so Catholics and other Christians cannot help but rejoice that one of the effects of our alienation from God, racism, has been mitigated. Redemption works. And Obama’s candidacy is an anticipation of that “great, getting’ up mornin’” when God’s reign will be finally established. It’s a commonplace now to speak of Obama’s “soaring rhetoric” or “the microphone loving him,” but I don’t think enough attention has been paid to how really good he is as a speaker. Listening to his victory speeches after Iowa and South Carolina, and even his concession following New Hampshire, the back of my neck tingled and I felt a profound gratitude at being able to live in this nation. My parents felt much the same, they’ve told me, when listening to FDR’s “fireside chats” (even though they were staunch Republicans) and I remember a similar feeling as a teenager when listening to Martin Luther King and Bobby Kennedy. Barack has harnessed the cadences of King (and the black church) to produce his rhapsodic riffs on the power of hope, and these are driven by a dynamic connection with the people that’s unmistakably genuine. The latter is what Bobby Kennedy had, by far the best of the Kennedys. Like his brothers, Bobby was obviously, in part, a creature of political calculation, not jumping into the 1968 presidential race, for example, until Eugene McCarthy had exposed Lyndon Johnson’s vulnerability. Unlike his brothers, though, he was a man of personal integrity and genuine compassion. As Attorney General he stood up to the mob that helped elect his brother and answered King’s call for help in the South when President Kennedy was inclined to dither. King’s “I have a dream” speech and Bobby’s assassination still move me and grieve me as little else when film clips of these events are shown on TV. Obama wants to speak to the concerns we all share, and when you think about it, the country is pretty well agreed on most of the major issues that need to be addressed. We need to counter Islamic extremism, revive the economy, fix health care, and adopt a reasonable immigration policy. I like it when Obama says that in the national health care debate the pharmaceutical companies will have a seat at the table—they just won’t be able to buy every seat at the table. He goes out of his way to avoid the class warfare of hard-boiled progressives, emphasizing that not much will get done unless everyone’s interests are considered. (In fact, one of the few unconventional and indisputable things Hillary Clinton has said during the campaign is that lobbyists represent the interests of real Americans, too.) I like it when Obama says that he would strike at terrorist camps in what are effectively lawless regions whether other nations agree or not. I like it that his health care plan is voluntary, because the government should use its compulsory powers as little as possible. When the conversation comes up, I wish he would say, though, that his plan is voluntary because the American idea is freedom, not “maximizing choice.” “Maximizing choice” is progressive-speak for allowing the children to choose between vanilla or chocolate, while the grown-ups pretend that pistachio doesn’t exist. As to what I can gather about Obama’s character from outside observation, he seems genuinely warm, a little nerdy, dignified, thoughtful and with a beguiling reticence—he’s not crazy for power but somewhat astonished, it seems to me, that history has chosen him as a darling. While he was listening to Ted Kennedy’s endorsement, I imagined him thinking: “You know, I might actually win. I could become president.” If he’s the man I think he is, that put a lump in his throat, as it should anyone. Here’s a man who’s capable of admitting that he was watching a football game rather than attending every word of a Republican debate that preceded one by the Democrats, and who will actually tell us, when asked to admit to a failing, that he’s bad with paperwork rather than pretending to moments of weakness in his role as political suffering servant. He’s real. That alone makes him sui generis in 2008. But here’s why I cannot vote for him. He says he believes that his Christian faith is all about “the least of these my brothers,” extending justice to God’s favorites, the poor. And I agree, brother, Amen. But there’s no reason to fight for the poor, for social justice in education, for policies that support working families and the health of communities, and for those who are terrorized and oppressed internationally if life is not sacred. If life is not sacred, we will end up not serving the poor—having abandoned the defenseless—but destroying the human person. Obama’s Christianity embraces social justice, but a social justice that’s not grounded in the primary value of life—from conception to death—is worthless, and will, in the end, betray itself. The judges Obama would nominate to the Supreme Court will guarantee that result, even if the compartmentalization of Obama’s thinking keeps him from confronting this truth. An Obama presidency would mean a succession of Ginsburgs, Souters, and Stevens. As my wife said to me, if Obama would just declare himself pro-life, he’d sweep the country. That actually might come to pass, at least in a general election, although he’d never receive the Democratic nomination if he even hinted as much. But to those politicians who truly want to “unite the country,” it’s long past time to recognize that its youngest citizens, the unborn, have rights, too. Your last points really hit the mark on the false enmity placed between human life and social justice. The refusal to realize the primacy of the first leads to a diminished ability to to truly work for the second. However, ever if Obama were pro-life, I find his personality cult holds way too much fascist potential. I work with a dude who has one can only be called a shrine to the man in his cubicle. He probably has votive candles for the one at his house. Well said, Harold. I think the importance of being able to unite and inspire a country through good old-fashioned rhetoric has been undervalued these last few decades, we’re so used to leaders who can barely put two intelligent sentences together. I’d vote for this man in a heartbeat…if he were only pro-life. When are the Dems going to get a Clue? If Mr. Obama were genuinely pro-life, I suspect he would also reject much of his current philosophy that argues for socialistic solutions to human problems. The article labels these problems as “concerns we all share, and when you think about it, the country is pretty well agreed on most of the major issues that need to be addressed.” OK, but the argument isn’t about identifying issues, it’s correctly identifying causes to problems and then solutions originating in true charity. One cannot overlook the last 50 years of “social justice” underwritten by trillions of tax dollars, leaving us with problems worse than when we began. More of the same will not solve the problem. Obama is a good speaker, inspiring. The problem is in what he’s selling, his message of change is actually a call for more of the same bloated government policies that have debased humanity and created a slave-class, lost without mother-government. Where’s the love in that? Thanks to Johnny and Debra for their kind words, and Chassup, you have more a friend in me than you know. If Obama were to be elected and really wanted to revive America’s educational system, for instance, he’d have to talk about more than simply improving teacher salaries. (He began doing this in Virginia, actually—a hopeful sign.) Great schools depend on stable families, in which a mom and a dad work together to educate their children, with the help of teachers. The attitudes of secular elites (and often their social programs)have contributed directly to the rampant dysfunction of our culture. See William Dalrymple’s wonderful books. One can only say so much in an article. As usual, I wind up feeling broken when asked to choose between compassion for the poor in the womb and compassion for the post-partum poor. One happy day a candidate may offer both, when America’s bipartisan blindness is healed. Abortion entrenched as it is, however, perhaps we can settle for a good man? It’s easy to forget that we’re not just talking about a slate of issues without the all-important “pro-life” sticker. A person is in question, and I appreciate that this person has used his freedom to be with the least, including, I hazard, those poor single mothers who are the ones most often cornered into having an abortion. Many freedom-touting pro-lifers could not say as much. I heard Obama in person in NH, and I think an inspiring person at the helm would do more to promote a right use of freedom in America than all the wise policy in Washington. I would also relish a McCain v. Obama race, because both have strong points and seem to be real, good men, unlike the train wreck v. train wreck that was Bush-Kerry. James: As per you conundrum—“choose between compassion for the poor in the womb and compassion for the post-partum poor.” The answer is actually very simple, but you are looking for solutions based on a misconception; specifically that government is the best solution to human problems, or can solve these problems at all. As in the case of abortion, it seems obvious to pro-lifers that government is part of the problem. Bad law was created out of thin air “giving” women the right to choose to kill their babies. In the case of post-partum poverty, or any other social justice issue discussed in this campaign, government is usually at the center of the problem, not the solution. I’ve seen government “solve” the poverty crisis for over 50 years pouring trillions of dollars into the system, and the problem is no better, worse in many ways. The solution to any social justice predicament must begin by treating each individual as a unique human person deserving of love. Government is incapable of serving in this way, and fails miserably all the time. No matter the good intentions, government can only apply one-size-fits-all policies and refuses to make moral distinctions, both of which lead to failure when dealing with humanity. Policies billed as addressing “social justice issues” are all too often unjust and uncharitable leading to the direct opposite of the stated goal. I do agree with your wish for decent people as candidates. I don’t see what I really want in either Obama or McCain in that regard. Obama is an outright socialist, and McCain displays a lack of conviction. We desperately need a hero, but I don’t see one, in the mean time we are forced to hold our noses when entering the voting booth. The lesser of two evils seems to be the choice this year. I know I am new here, but what am I missing? Mike Huckabee is my man this year, and I would put him up against anybody as an great leader and speaker. Compassionate to the core, will cross party lines when it means taking care of people in need, Pro-life as they come. Perhaps his style isn’t all glitz and glamour, but that is called humility, and only a truly humble man deserves the Presidency. Huckabee, to the end, all day long. Damon, I am an admirer of Huckabee as well, particularly for his pro-life stand, as you’ll see if you follow the link on the left to “Why Huckabee Makes Evangelicals Nervous.” I do think he has some blind spots when it comes to the manner in which he presents his views, although his sense of humor and readiness to engage all points-of-view is tremendously refreshing. Also, I think Huckabee is trying to find his way toward a true compassionate conservatism, in which government is a fair arbiter of economic interests—taking an even hand toward both Wall Street and Main Street—while maintaining safety nets that show a due regard for human nature. Chassup makes a good point about government’s one-size-fits-all mentality and refusal to make moral distinctions. I do think, though, that government programs can be based on more or less adequate views of the human person. The welfare-to-work reform, for instance, which embraced the dignity of labor, was an improvement. I love what Chassup says: “The solution to any social justice predicament must begin by treating each individual as a unique human person deserving of love.” Only the Church can really do this, and the more we take up our obligation to serve the poor, the less government has to intervene with its ham-handed methods. Faced with this reality, we have to think hard about what the Church should be doing and can do versus functions that properly belong to the state. The existence of the social welfare state can be seen, from one angle, as a sign of the Church’s failure. One of the things I’d like to see here at GodSpy is a full-scale discussion of these questions, with all options on the table. Should we deconstruct the welfare state and empower private agencies to addresss social justice concerns? Or should the social welfare state, at least in certain respects, be considered an achievement of the Christian influence in society? That’s precisely the type of discussion that GodSpy is here to engender. Harold, I did read you article - (after my last post), and though it was well done. To answer your question in the last paragraph, an either-or question: Yes and Yes. Our churches should be reaching out to take up the slack of “ham-handed gov. programs” and those hams should go on a diet and try to run themselves more like the effective church programs. He will bring ALL things to Him! Neither our churches or our government will ever be perfect. But we can strive to make our hearts perfect. I’m not voting for Huckabee because he is perfect, but more because he understands imperfection well. And I know it is a long shot, but our faith shouldn’t yeild to politics, our politics should yeild to our faith. That is how many of the country’s founders believed. And hoped we would believe. Pardon the double-post. And please forgive me if I begin to sound like I am campaining for Huck, but I realized that my previous post was lofty-sounding with no meat and potatoes, so here it is. That was a decive smacking of the ham-hand of government and an empowerment of the people. Had he been President at that time many lives would have been saved by the clarity of mind to cut through the finger-pointing and just take care of people. I want that kind of mentality to infect our government on all levels, from social justice agencies to the White House. I just wanted to say I really appreciate your willingness to dicuss these matters. All these things are on my mind as I contemplate November. I think the other commentators have been thoughtful as well. I also hope more of these conversations continue! I also admire Obama. His passion excites me and it seems to be engaging many in this country. R.E. “That actually might come to pass, at least in a general election”—how do you figure? From what I’ve read, when Obama was in the Ill. state legislature he voted against the Induced Infant Liability act, a measure forbidding doctors from leaving babies that survive a late-term abortion to die. How would you expect him to make the leap from sanctioning babies dying by negligence to becoming pro-life? Good point CAFFEINE PATROL, Obama’s vote on that legislation exposes the core of the man—a core that he attempts to hide—he is a secular humanist, a relativist and most likely an atheist, in my estimation. If a man is against compassion to infant human beings, do you trust he cares about you? Could his claimed compassion for the poor be real? Could he really care about all people, all Americans? Or, as his vote proves, does he actually only care about those humans who fit a specific class, like “wanted” or “convenient” or “useful to his vision?” To think that this man will move to the right (life) on this issue is beyond naive, and looks like wishful thinking which is a dangerous way to choose a leader. Defense of open markets, militarism and the destruction of foreign cultures for individual and corporate prosperity may be just as damning as voting for Obama (please note sarcasm); defense of torture, of false imprisonment, of denying certain persons (who have not been convicted of a crime) of basic human rights, smacks more of fascism than accepting a pro-choice platform. If life begins AND continues, why must you stake your vote on ONE violation of the sanctity of human life rather than examining every position regarding the sanctity of human life, nuanced or obvious, of the candidates? To answer your first question, “What is pro-life? Does it refer only to the life of an unborn child?” No, pro-life is a philosophy that recognizes, cultivates and defends the ideal for society that all human persons, from the instant of conception to natural death are unique and precious gifts from God deserving of love. This respect for life includes all human persons no matter the stage in life, socioeconomic class, level of physical, mental or spiritual facility… even secular humanist utopian socialist liberal politicians deserve to be loved and cherished. Your second question, “…why must you stake your vote on ONE violation of the sanctity of human life rather than examining every position regarding the sanctity of human life, nuanced or obvious, of the candidates?” Good question. We should examine the candidates for evidence of their philosophy across a broad spectrum of issues. But, we need to judge accurately. We need to apply truly pro-life criteria when judging a candidate’s record. The end result of a well-intentioned policy that is not based on true love is often the opposite of the intended goal. Some might assume a candidate to be “pro-life” because he votes to support an entitlement program that actually, in the end enslaves people. I find socialist policies to be like that most of the time. Go down the list of issues in this campaign, each one presents a problem that can be addressed with love, or without love. Don’t accept solutions on the surface, make a dynamic analysis, try to find the love in not only the feel-good intention, but also the likely result. Sometimes real compassion is tough, and we need to have courage. And remember that the political solution to the human condition is always liberty. The most precious gift God gave us is liberty—free will to choose good or evil. All government policies must support that principle to be just, to be pro-life. I have great compassion for women who have had abortions, as I do for all sinners. But that compassion—the product of love—doesn’t seek to appease sin or alleviate guilt. True compassion seeks to lift people out of sin, including the use of laws to regulate and correct behavior. Personal accountability is a necessary component of a truly compassionate culture. I agree with you in theory, and to some extent in action, but I find it difficult to believe that an examination of the current stance of the Republican party and the majority of its members will yield the conclusion that it/they is/are pro-life as you define it (and by the way, with which I whole-heartedly agree); and I would like to know how any moral person can support individuals who turn a blind eye to or actively support the policies of wiretapping of free citizens, the imprisonment of “terrorists” at Guantanamo Bay, the “necessary evil” of over 1 million Iraqi casualties (source: http://www.justforeignpolicy.org/iraq/iraqdeaths.html), the complete ignorance towards the pockets of American culture that are hopelessly mired in poverty, abuse and disenfranchisement…. how can anyone keep voting for politicians who have long-supported all these anti-life positions just because the SAY they are pro-life. Might it not be a ruse to garner votes? And might it not be a worthless endeavor to worry about overturning Roe v Wade any longer and simply work on a more organic and productive level to save unborn children, to improve the society into which they are born, to help the family unit that they will grow up in, and to assure a more peaceful and less intrusive government to protect them? I just can’t see how personal conscience does not also apply to other forms of protecting the sanctity of human life. I think you and I agree on much. I assume no illusion that the GOP is a “pro-life” party or that all Republican candidates offer a truly pro-life choice. The DNC and its candidates are even worse in that regard. 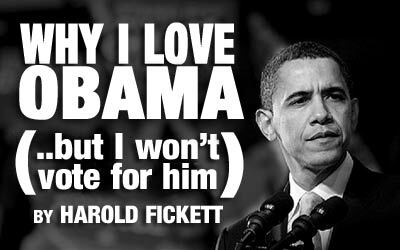 Reading between your lines, I sense that you search for a justifiable reason to cast a vote for Mr. Obama. I know many decent people who attempt to use “support for the war” as an example of evil equal to support for abortion, thus canceling the two and allowing a vote based on other issues concerning the human condition. I get that, I don’t agree, but you must seek peace within your own soul on that regard. My argument is pretty much this; let’s accept that abortion and the war cancel each other out as we judge candidates—Obama’s pro-death votes are as bad as McCain’s. Now, what’s left? As I’ve tried to convey before, traditional classical liberalism—what I call modern conservatism—better addresses the human condition while cultivating a true culture of life. Modern liberalism—what I call socialism and fascism—advertises social justice, peace, love and utopia, but actually cultivates a culture of death. I can, with a clear conscience, vote for McCain over Obama because he comes far closer to my philosophy. He is hardly perfect, but the lesser of two evils without a question. Where you and I separate, I believe, is not philosophy, but our approach to applying charity and justice. You see poverty and seek to fill the need with money from a program, I see poverty and seek to uncover the cause of that poverty and do what is necessary to correct the brokenness. Poverty is a symptom, not the disease. I believe modern liberals seek to treat symptoms because curing the disease puts them out of business. I think a better understanding of history clearly shows that money from government programs feels good, sounds good, but makes matters worse and usually misses the simple causes of most social injustices. Harold I thought this was a really good piece highlighting the dilemma many of us across Western Democracies feel. Here in the UK you often have that same problem of trying to find the best party to vote for in conscience. Sometimes if you are lucky you can vote for a candidate who does not share his/her party’s stance on abortion for example and will courageously oppose party policy. However unlike the US the British Right - ie The Conservative Party - are not pro-life. Indeed it was Margaret Thatcher who introduced research on human embryos and vetoed a Catholic MP’s attempt to reduce the abortion time limit. It got me so mad when I saw that guy O’Sullivan talking about his book linking Reagan, Pope John Paul II and Thatcher on EWTN last year. Like many Catholics in the UK Conservative Party he conveniently overlooked her poor pro life track record. I used to be a member of the Green Party but let my membership lapse when I saw its support for embryo research yet it strongly opposed vivisection. Sometimes you have to go for the least worst option. My folks MP is pro choice but is a staunch opponent of euthanasia. If none of the other candidates at the next election are any better they will go for him because we have a chance to stop the legalisation of euthanasia if enough members of the ruling Labor Party oppose it. Tony gives us an excellent model for inspiring change one issue at a time, within the limits of a government whos leaders are all too imperfect. I guess I was hoping this would be the season to make progress on the abortion issue, hence my support of Huckabee. One thing is clear however, there can be no “Pro-life” vote, or “Catholic” vote that is going to make any difference if Pro-lifers and Catholics divide their votes. I am not crazy about the GOP, I am outrightly ashamed of thier record on Death Penalty and War. Abortion however still carries the double-duty of being a human life issue, and a civil rights issue, as well as having the greatest potential to change the way people think about all human rights issues. If the least of us have a right to live, then we all do. I agree with MARYHR that we need to make progress on making abortions unwanted rather than putting all our efforts towards overturning legislation. I can’t help but think if Mother Teresa was an american at this time, she would not be protesting laws, she would be on the streets, saving lives, day-in, day-out, a living witness. That is the challenge to us all. I agree, “pro-life” is not limited to “anti-abortion,” but I think that all other “pro-life” sentiments are rendered moot if someone (Barack Obama, in this case) greenlights abortion, especially in the heinous ways he as a state legislator did. I will agree that it is hyprocritical to only be pro-life on one end of the spectrum; I will even allow that a lot of vocally “pro-life” politicians offer nothing but lip service. Back in the ‘90s we had a governor in Kansas who experienced a pro-life conversion at the same time that it became clear that his “pro-choice” views were unpopular with voters (he wasn’t re-elected anyway). Any politician who offers universal health care while also supporting death by neglect for babies who survive abortion can keep walking, in my opinion. For the first time since I was old enough to register, I am not voting for a presidential candidate this year. A priest whose work I love and respect wrote a piece on Catholic Exchange about our moral duty to vote. I posted a comment to the effect that if I am offered a choice of a plate of broken glass or a plate of rusty nails, I will starve, thanks (my comment was briefly posted, then deleted). No disrespect at all this or any other priest, just my heartfelt feelings about the political situation in the USA. CAFFEINE PATROL, it is your moral duty to cast a vote for the lesser of evils, if that is your only option. (can’t find the specific quote at this moment, but JPII advised that, not me) Not voting at all is indifference, and that is always wrong. I hate to reduce this to such a grim calculus, and I know that the raw bodycount is not always the best way to discern the good, but are we really equating the tragic war going on in Iraq with the unspeakable enormity of abortion in this country and abroad? The former has taken thousands of lives and is wrong, but the proper moral response to our current entanglement is ambiguous. The latter has taken MILLIONS of lives and is morally unambiguous. In both cases, the pursuit of ‘freedom’ at the cost of fundamental rights (like the right to life) is license, not liberty. But it seems outrageous, and a real distortion of reason, to try to ‘cancel out’ the enormity of abortion with the current war in Iraq. I don’t think you should be shy about your “calculus.” You’ve made a very simple and reasonable argument. I also think it is wrong to assume, in your calculations, that the current war is wrong. Abortion is always zero in any equation. Wars, by their very objective, are always horrible, but not necessarily wrong. It’s an important distinction. No matter your opinion on the current war, it has actually cost more American lives than it had to because it was prosecuted with a particular effort to err on the side of caution when considering innocent life. Innocents have died, as in every war, but we sacrificed many American lives to reduce the innocent collateral damage. Perhaps another grim calculus, but worth considering when decrying civilian deaths. You are correct about “freedom” being used as “license” in the case of abortion, and distorts the true meaning of human liberty. In the case of war, sometimes it is better to die defending liberty than to allow tyranny. I think this is a very American concept, and one I acknowledge as consistent with moral good. Single issue voting is why we currently have the president we do, and what a great choice that turned out to be. While it is morally commendable to take a stand against killing (any?) human life, blinding oneself to the idea that voting for a “pro-life” candidate will somehow overturn Roe vs. Wade, meanwhile ignoring other ramifications that affect our country (and future children) solves and saves nothing. I agree with mootpoint. I believe single-issue voting is bad and irresponsible. When I vote, I consider ALL the important issues. I look at the person as a whole before I make my decision. Also, just because someone says they are pro-life, doesn’t mean they are. GWB is supposedly pro-life, yet during his tenure as Governor of Texas, more people died from the death penalty than any governor before him. Don’t even get me started on the war in Iraq…..
RENEGADE_PILGRIM, add all the death penalty deaths and all the war deaths together during the last 12 months, use the highest estimates you can find, and the number pales compared to the 1 million+ human deaths by abortion during the same time here in America. Catholic teaching very clearly points out that you MAY NOT vote for an abortion supporter UNLESS there exists a proportionate moral evil to consider. The argument you make falls way short. Your argument is an attempt to justify voting for Obama knowing he is the most ardent supporter of abortion running for office, your argument will not provide you cover for the feelings of guilt and culpability you risk. I am dismayed to read comments posted here that try to justify supporting Obama by saying that it is wrong to be a single issue voter. By that reasoning, if you were faced with an otherwise acceptable candidate who was pro-slavery you would be compelled to support him. Barack Obama’s open, blatant promotion of abortion disqualifies him. His abortion stance is a non-starter. If you doubt this, watch the video of his speech to Planned Parenthood (you can see it on youtube; there is also a link at catholicexchange). He is both glib and unequivocal about his plans to promote abortion if he is elected. The bonus? His administration will be using your money to pay for abortions (as, apparently, has the W. administration, but that’s another topic). CAFFEINE PATROL, I have been dismayed and, frankly, confounded by the cult-like loyalty and adoration shown Obama, by even Catholics I’ve known for years to be faithful, well catechized and otherwise not open to deception. The essay linked here is one of the best pieces I’ve read this election season, the author explains the phenomenon, something he has known all his life, growing up in the middle east. Very fascinating, depressing and scary. The comments here are a tragedy in motion, dating back from Feb of 2008 until now. What we don’t know about this man is beyond belief. How the media and the DNC HAS NOT vetted this individual is incomprehensible. He has nothing but a record, a history, of associations with radicals, terrorists and criminals. To date he has failed to show a certified birth certificate, to qualify him as a natural born citizen of the United States. There are years of cover up from his time at university. His community activist role is code for a follower of Saul Alinsky, a self proclaimed follower of Lucifer. And, the latest, Bill Ayers 1974 book which pays tribute to Sirhan Sirhan, the assassin to Robert Kennedy. I pray America will wake up from this tolerance to the obscene. A journalist from the UK seems to understand what some of us see, why are so many Americans blind to reality? • and laws in 16 states that provide for ultrasounds before an abortion. You are out of your mind, America’s original sin is the taking of the Native American land in the first place, it’s not what we used to be, it is what we are now… To read the articles of a person lacking the basic knowledge of the American history, is worse than reading comic books. No rss feed for your junk Mr. Fickett.